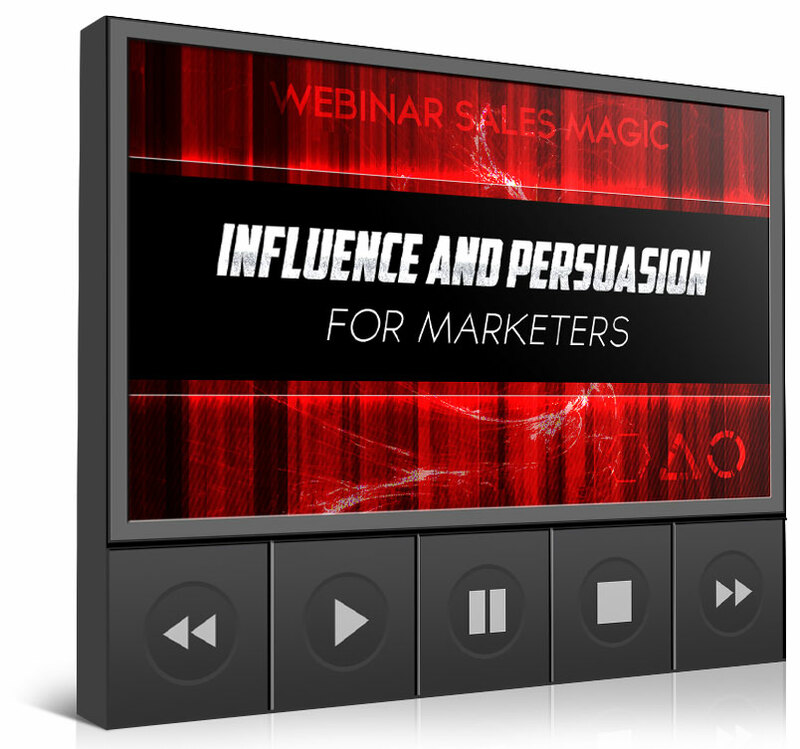 "Attract Money On Command, Sponsor 16-28 Reps PER MONTH And Sell ANYTHING With An Almost 'Magic' Webinar Sales Formula From Steve Jaffe"
What You Get with "WEBINAR SALES MAGIC"
Module 1: "Plan An Irresistible Webinar "Hook" That Pulls In Registrations And Sales"
Webinars are very common. To maximize results, you must get your webinar to stand out above the noise. Module 2: "Attract A Flood Of Registrants"
Module 3: "Attendence Boosters: How To Get HUGE Numbers Of Registrants To Actually Attend Your Webinars"
Only people who ATTEND your event will buy. And not everyone who registers shows up. Maximizing the "show" rate is CRITICAL to your bottom line. Steve's Pioneering Tactics That Get A Ridiculous 60% Of Registrants To Attend When 30%-Attendance Is Considered "Normal". How To Intensify Registrants' Desire To Attend Your Webinar, Using An Email Sequence That Pushes The Prospect's "Hot Buttons"
Why Bribing People With A "Free Gift" To Attend Can Actually LOWER Attendance And Sales Conversions. The Crafty Strategy Steve Uses That Compels People To Show Up 15-30 Minutes Early For Your Webinar, So You Have A "Full House" As Soon As Your Webinar Begins. Module 4: "The Webinar Presentation Template That Closes Like Crazy"
How To Boost Sales Using Influence Triggers Such As Authority, Reciprocity, Social Proof, Liking And Scarcity. 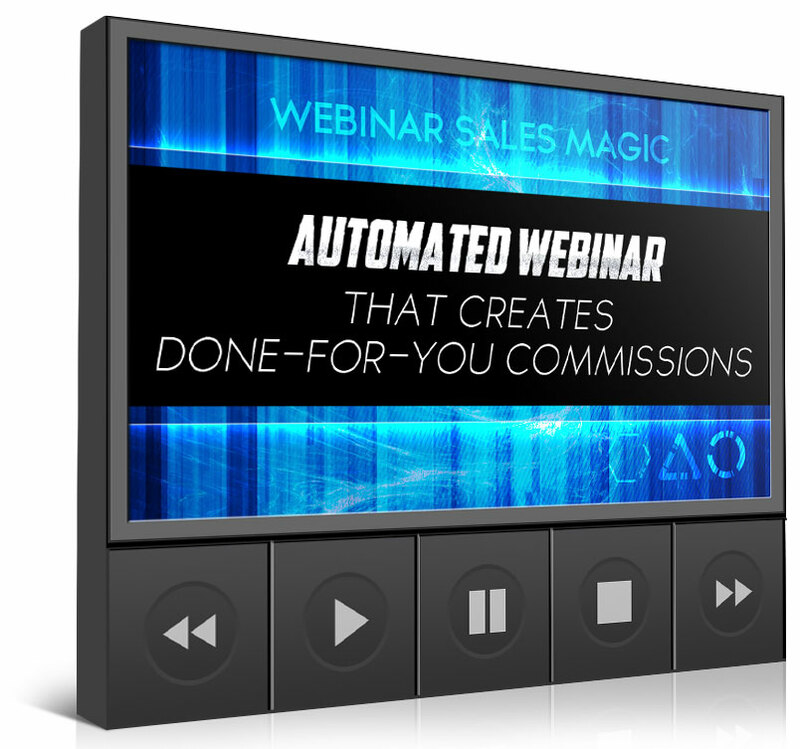 Automated Webinar That Creates Done-For-You Commissions! 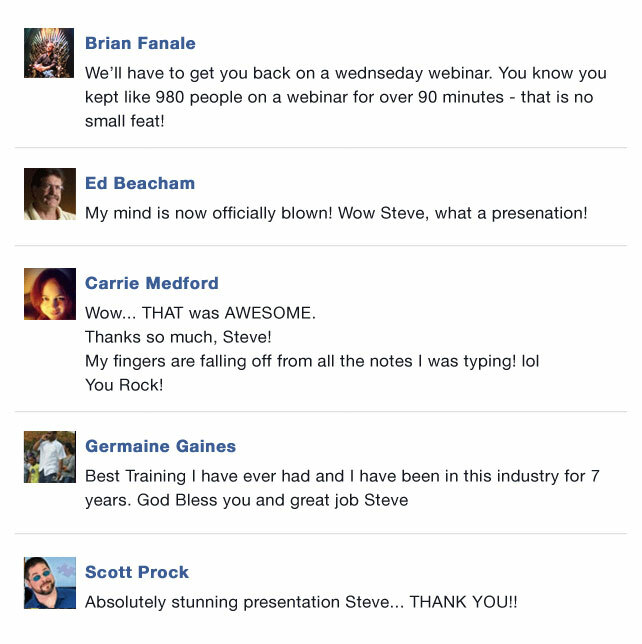 High-Converting Webinar: Steve Has Tremendous Credibility Selling His Course! This Is Like Steve Personally Selling On A Webinar For You...And YOU Keep The Commissions! "Fill-In-The-Blank" Webinar Slides & Registration Page Template! Just Start From Steve's Proven-To-Convert Webinar Content, Swap In Some Of Your Own Words, And Presto! Instant Webinars That Match The Closing Ratios Of Millionaire Top Producers - Even If You're A Newbie! MIT-Trained MBA Steve Tracks Every Metric In His Webinar Funnels And Constantly Tweaks And Tests EVERYTHING To Achieve The Highest Webinar Metrics In the Industry. And YOU Get His Best-Converting Templates! You Get Steve's Webinar Registration Page Template That Converts On Average 86% Of Page Visitors Into Webinar Registrants. ("Normal" Conversion People Get Is 20%-30.) Meticulously Tested And Tweaked In Steve's "Webinar Lab", You Get Perhaps The Highest-Converting Webinar Registration Page Template In the Industry. You Can Make BIG Money Even If You Have A Small (Or No!) List. BOOM! 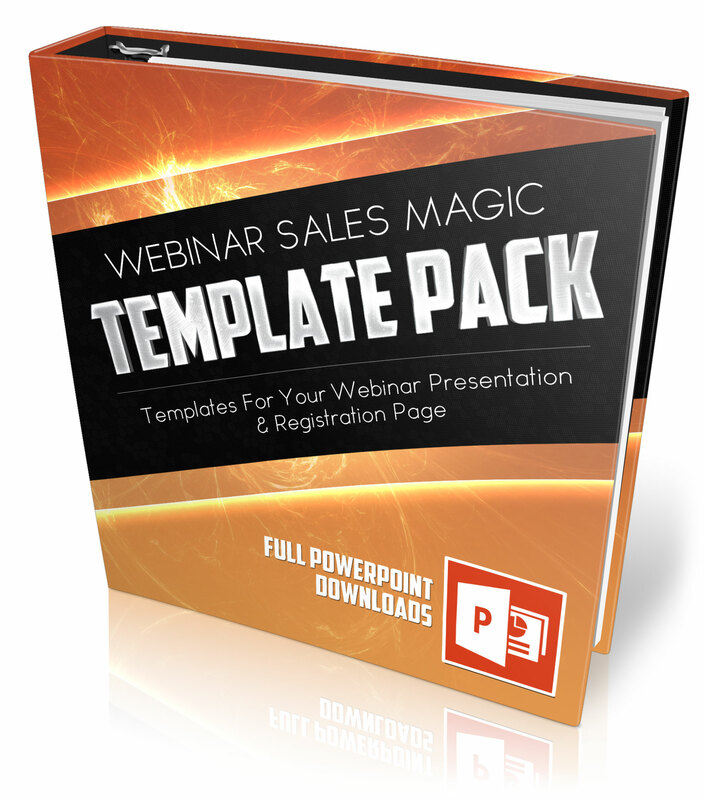 You Also Get The Same Presentations (Raw PowerPoint Files) Steve Uses To Close An Astonishing 18%-27% Of Webinar Attendees And Earn $3,000-$10,000 Per Webinar. This Is Like Getting Permission To Take A Da Vinci Painting, Tack On A Signature, Sell The Painting As Your Own, And YOU Pocket ALL The Proceeds! 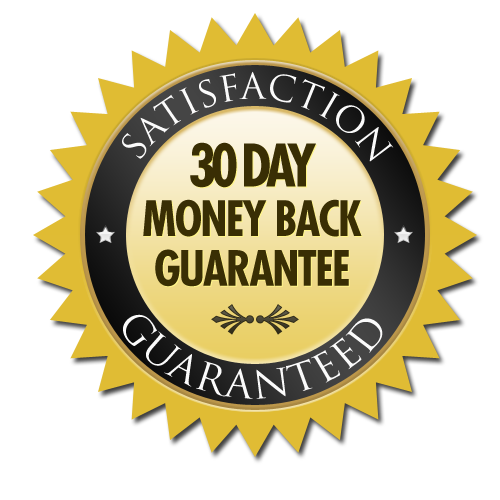 Get World Class Results, Instantly! The Proven Emails Steve Uses To Warm People And Drive Them To YOUR Webinars Predispositioned To BUY YOUR STUFF! Create Your Own Webinar Promo Emails Quickly By Working From Steve's 'Paint-by-Numbers' Proven Emails. Leapfrog The Copywriting Learning Curve! 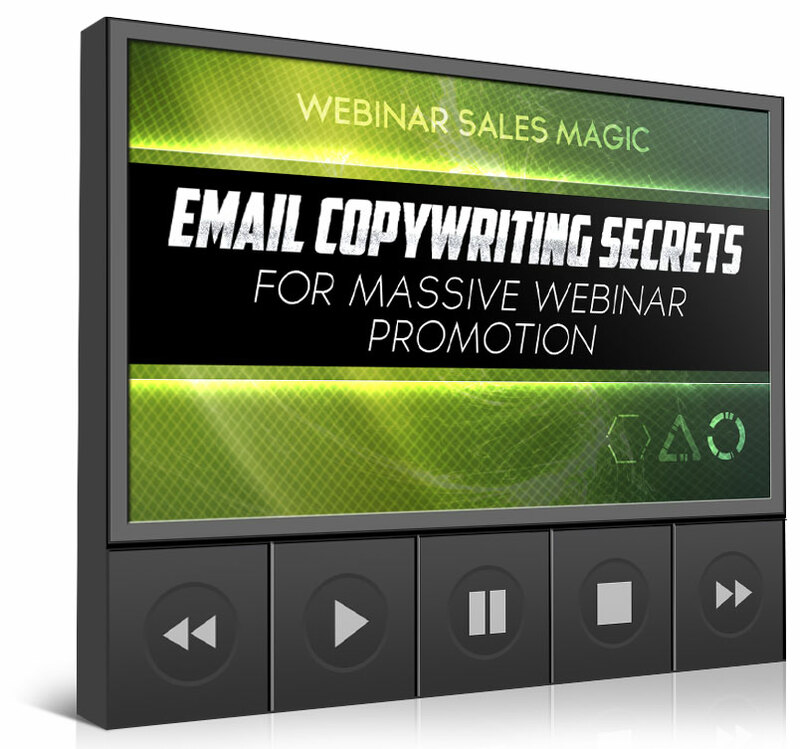 "Steve's Pre-Written Emails Have Been able to Drive Sales Upwards Of $10,000 Per Webinar. 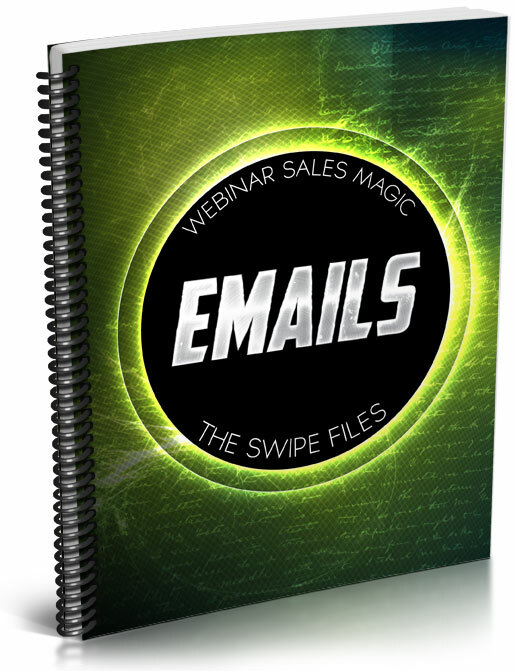 These Battle-tested, Proven To Convert Emails Save You WEEKS Of Prep Time And Virtually Guarantee Your Success." 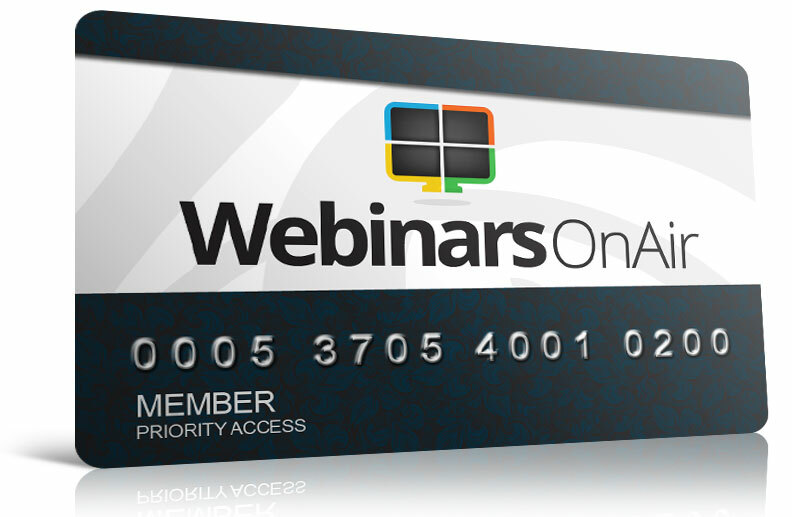 Get FREE 30 Days Access To Webinars On Air, A Cost-Effective, Versatile Webinar Hosting Platform. 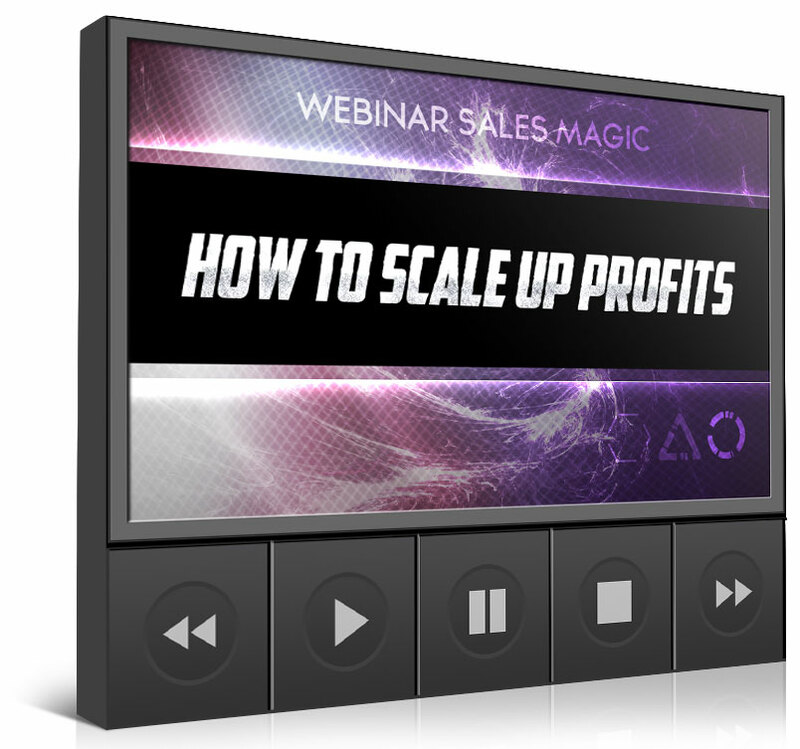 Start Hosting Webinars and Make More Money Immediately with what Steve Jaffe shows you! 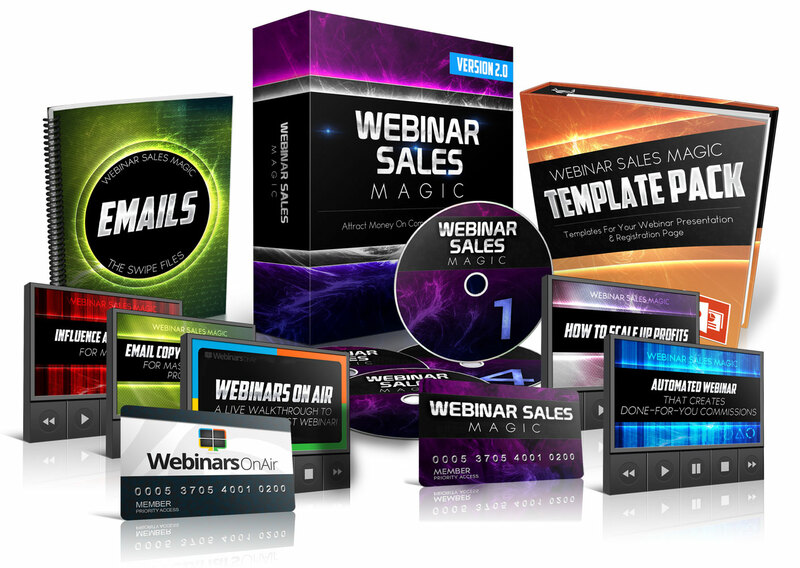 Webinars OnAir just released AUTOMATED WEBINARS, a subject that Jaffe is going to dissect inside this 6-Week Course... PERFECT Timing and TONS of Leverage! One of the Webinars OnAir founders sits down, takes your hand, and walks you through the VERY simple process of setting up your very first webinar! This will 100% ensure that you understand how to easily set up LIVE, Automated, and Recurring webinars for YOUR business... PRICELESS! The Secret To Emotional Transference, Storytelling "State" And Other Advanced Persuasion "Hacks"
Brian Fanale's Emails Have Cumulatively Driven Over 400,000+ Webinar Registrations And Over $25M In Online Sales. Legally Steal his Favorite E-mail Hacks & Secrets to Get More Attendees, Sign-Up More Reps, and Make More Money with YOUR Webinars! BONUS: "Fill-In-The-Blank" Webinar Slides & Registration Page Template! 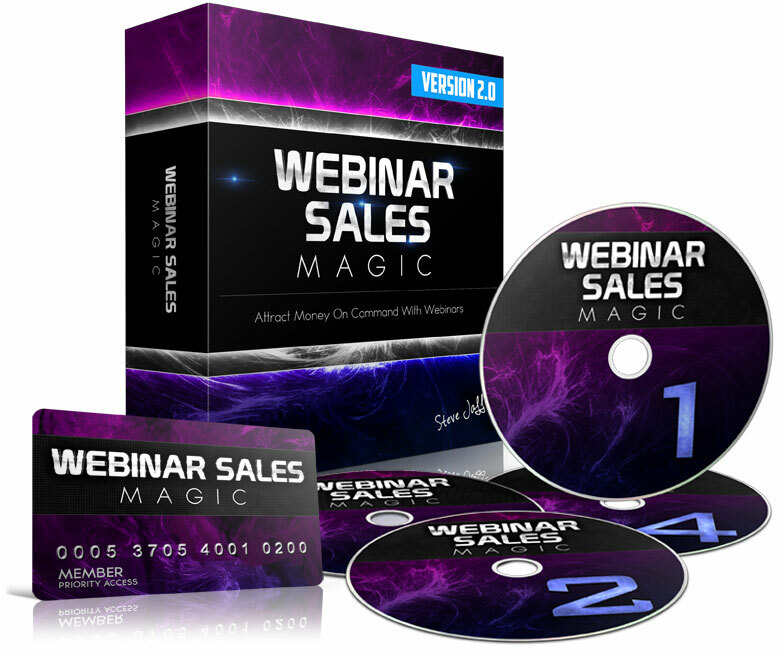 If you don't feel 'Webinar Sales Magic' will make you more money than you ever dreamed possible... simply e-mail [email protected] and we'll gladly refund you 100%, NO QUESTIONS ASKED! The risk is on us: Let us prove to you that 'Webinar Sales Magic' will change the course of your financial destiny. "I applied a lot of the principles that Steve teaches, and I've got to tell you, I've seen webinar registrations go up by 40% and I've seen my sales go through the roof. What he teaches is right on the money. I can't recommend this course enough!" "In week five I went ahead and did my first webinar. On my webinar, using every single technique that Steve Jaffe taught us, I was able to have 100% attendance and I had a closing rate of close to 35%! I highly recommend Steve's course." "Before I met Steve I was unable to make any sales using webinars. Since taking Steve's training and applying his techniques, on my first ever sales webinar I wound up making 4 sales totaling $1000. But the best part is I can now print money on demand and people are now seeking me out as the authority and leader in the marketplace! Thanks Steve, you've made a huge difference in my business!" 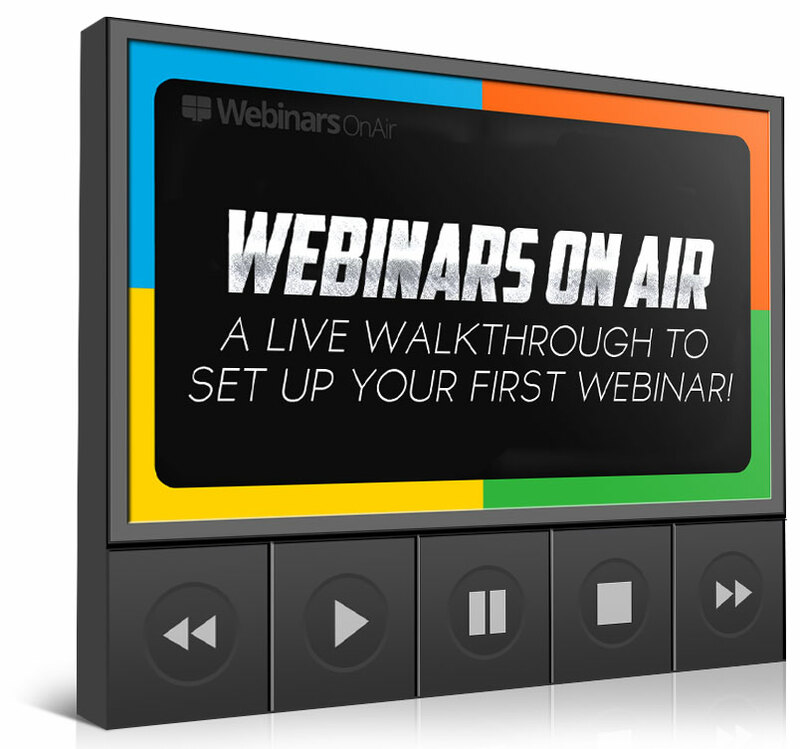 "Webinars really are the game changer for anyone struggling in their home business. 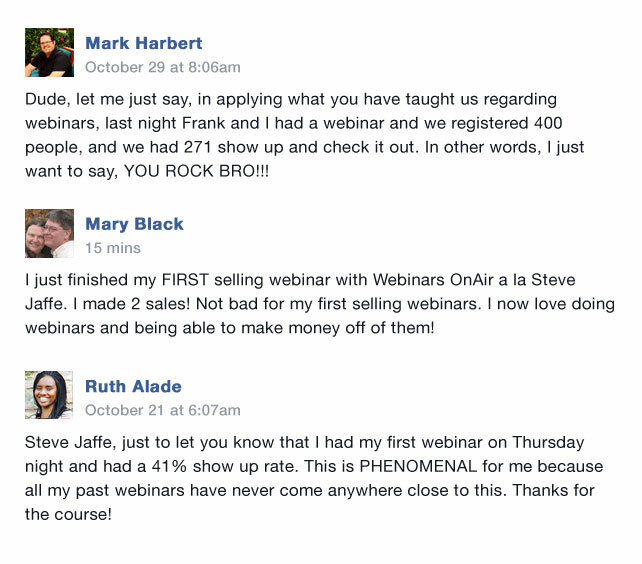 This is the number one strategy you must have, and Steve Jaffe is just the king of webinars. I was able to implement 2 of his many tactics in a short time and had my very first 5 figure launch. I know this course will help you in your business!"